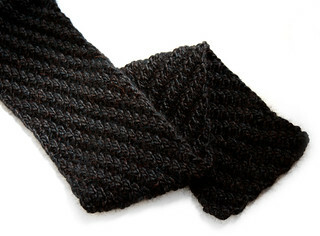 A cosy, chunky-weight scarf in a reversible, diagonal rib pattern. When I came across this stitch pattern I knew it was ideal for a scarf – simple, reversible, quicker to knit than seed stitch and normal 2×2 ribbing (because it compresses less). I’ve given it a beginner rating because it’s entirely knit and purl. However, it requires a bit of concentration at first because you have to purl stitches that look like they should be knit and vice versa. If you get lost, use the photos below to check whether you’re on an odd side (rib pattern moves one stitch right) or an even side (pattern does not move). I have given instructions for slipping the first stitch of each row for neater edges. The yarn is a warm and luxurious baby alpaca with a beautiful drape. This can be substituted for most chunky-weight yarns. To knit this pattern in different yarn weight, simply swatch using the yarn’s recommended needle size to find the number of stitches that will give the width you want, then round to the nearest multiple of four. Repeat rows 2-9 until you run out of yarn. Staggered Rib Scarf by Suzie Blackman is licensed under a Creative Commons Attribution-NonCommercial-ShareAlike 4.0 International License. I like the way this pattern looks, however I’m having trouble with Row 3 already. When I follow the pattern I end up with P2 to the last stitch, not K2 to the last stitch. I haven’t tried to go beyond this because I really don’t want to waste my time. Could you please tell me how to proceed. Thanks for letting me know, you’re absolutly right. I have amended the pattern and double-cecked everything. I have attempted the fixed pattern and am sad to say that no pattern emerges. I can’t figure out which row is off, but I am thinking it might still be row three. I really like the scarf in the photo and would like to make it work. Can you check the pattern again? The pattern is correct. You wont see much of a pattern until you finish row 8, but by then you should the diagonal pattern emerge. It does look odd at first, especially if you’re used to stocking stitch, but stick with it. Hi! Just want to thank you for this pattern. I love it! I am new to knitting and I just wanted to know – If I wanted to make the scarf wider, what would I have to do? To make it wider, just cast on 4 more stitches (or a multiple of 4). The pattern will work fine as long as you add a multiple of 4. Thanks so much Suzie! This is such a beautiful scarf. i’d love to try making this scarf.. it looks really cool.. however i don’t know what the s/1 and s/1p mean.. i’m sorry if this is a stupid question.. i’m a total beginner. thanks for your help and your time! It could be that when you re-joined the yarn, you started one row out from where you left off. Knitting an even row when you were on an odd or vice versa. What a great pattern, I have been looking for scarf patterns as I have 14 to do as Xmas pressies, I’m doing this one for one of my brothers and I’m going to do the ruffle lace scarf for my niece. Christmas gift, but my hubby wants to keep it. I may have to knit a few dozen more!! I love this scafe pattern and appreciate it. I can’t wait to make it. However, there is several comments about your ruffle lace scarf and I was wondering if you could please tell me how to locate that pattern as well. Thank you so much for all your help. Hi Lesa, you can find all the patterns if you click on ‘Knitting patterns’ in the navigation in the left-hand column. Or, use the site search. Glad you like the scarf! thank you so much for the pattern! I needed smth nice and very quick for a present and this scarf made a perfect gift! I made one small “addition” to the pattern to have even, neat edges – I purled the last stich in every row. I used “Berrocco” wool in wonderful grey color and it turned out lovely! I love this pattern, but for some reason, when I start repeating from row two my diagonal changes directions. Any idea what I’m doing? I’m not supposed to repeat row 1, right? You’re right – you should be repeating rows 2-9 only (row 1 is only worked once). If the pattern is changing direction it might be that you’ve missed a row somewhere. Check the slant of the pattern when you get back to row 2, on an even row the rib should be slanting top left to bottom right. If it’s going the other way there is a mistake somewhere in the previous repeat. Hi Gwen, slipping the first stitch of each row is a commonly used technique to neaten any raw edges, but it’s important to pay attention to the direction you’re slipping: If the final stitch on the previous row was purl, you slip knitwise, otherwise slip purlwise. I finished this today and am really pleased with the result. You are right in that you do need to pay attention – I did find myself going the wrong way a couple of times…but it’s beautiful wool to knit with. I have been looking for this pattern everywhere, do you know the proper name for this particular pattern? And also, do you think you could show how to make a hat with this pattern? I’m not sure how to do that myself, but whenever I have seen this pattern, it has always been on a hat! Thanks a lot for this pattern…I’ll get a nice scarf this week! Thanks for the lovely scarf pattern, I knitted this one for my 21 year old grandson for Christmas in a wool-ease size 10 needle, I did change the cast on to 20 sts to make it narrower. My grandson did mention he would like a hat this year to go with whatever scarf I made. Did you have a pattern for a hat that would be suitable for a man? He’s 21. I do think This scarf looks great on either a man or a woman. Diane – Here’s a pattern I found on ravelry.com for a hat that I think looks really nice on boys and men. I made one for my 10 year old son and he LOVES it (so do a lot of his friends): http://www.ravelry.com/patterns/library/a-hat-fit-for-a-boyfriend. It was a very easy hat and knit up quickly. Good luck! I love this scarf and have made 2 so far. One was for a gift exchange and it was fought over! I ended up making one for the person that didn’t end up with the scarf. This is an impressive scarf for the beginning knitter to make. I goofed up one of the slipped stitches and could not fix it. I tried to undo a few rows and pick up the pattern, but I couldn’t work it out… I’ve now started again!!! Any tips on how to undo the work and pick it back up again? I seem to get stuck when rethreading the needle with which way to go through the stitches, and I also have trouble picking up the pattern! I can only help you in finding the pattern again. Well I think I can help, not sure if I can explain it, but I totally lost the pattern at one point and ended up going the wrong direction. Looking at the pictures above really really help. Notice which way the pattern goes on even rows and on odd rows. That will help you to narrow down at least the rows you are on. Then look on the wrong side of the pattern and see what you left off with. Look at the pattern and see which row in the pattern matches what row you left off with. For example, if you know that you are on an odd side and you see that the last two stitches you did were a k2 then odds are you are suppose to be on row 5 because your even row 4 is the only row that ends on a k2 pattern. Notice I said your EVEN row ends on a k2, because there are odds that end on a k2, but if you are on odd row you want to look at the row before which is even. I hope this makes some sense! If not you can email me and I can try to explain it better. That makes sense! Thank you. This is where I had trouble – I’d picked up the stitches and looked at what I’d done last, but because there were 2 rows with that last stitch I wasn’t sure how to work it out. Hadn’t thought of odd and even rows (beginner knitter here!). Thank you again. Question, for the even and odd photos, are they from before you start the row or after you finish it? I can’t find out if I am on 4 or 7. If your work looks like the top photo you are looking at (and working) an even side. I have one more question — I followed the ‘slip’ stitches but I don’t seem to see as nice of a seam as I see from others’ projects. I had the most trouble when I started row 2 with Sl1 and k1 — there seem to be a hole on the side…I hope you now what I mean — is it because I am knitting not as tight as I should? It may look odd row by row but it should work out. You should end up with a neat ‘ladder’. I think I had a question on binding off but that message got deleted :( I am just wondering if I should bind off following the pattern. Since I will end with row 9, do I follow row 2 pattern for binding off and replace the slip with k and slip p with p, etc?? Hi Annie, the first stitch of the bind off row won’t make much difference. You could slip it as per the pattern or work it the same as the following stitch. I love this pattern and want to make it a bit wider if possible with a yarn not so thick or bulky. I thought of adding more stitches would that interfere with the pattern? The pattern works with any multiple of 4 stitches, so you can easily change your gauge. Wow this is really easy I caught the pattern right away. This is so nice I am making it for our loyal janitor of our barrack Mr. Kim he’s old man but works so hard. He deserves a scarf like this thank you. Hi, beautiful pattern. I’m just getting started. How do you recommend casting off? Which pattern row? You can cast off on any row you like. The pattern doesn’t really have a start or end. So thanks! From the Netherlands, Martine. Like everyone else I love this pattern – I wasn’t convinced to begin with, but persevered and once the pattern started to come through I like dit more and more! I am coming towards the end, but wanted to ask if I should cast off ‘in pattern’ for whatever row I finish up with? Or would it look better if I just knit my cast off row? I hope that makes sense – I’m a fairly new knitter! It will look best if you cast off in pattern. Casting off creates another row below the edge. Is there by chance a map grid of this pattern? My friends who don’t speak english can’t understand knit and purl. They go off these books that show a map on how to knit ponchos and such. Making this for my brother in law…wanted something gift worthy, manly enough to actually get worn by him, yet EZ and kind of quick for me…after LOTS of searching I was so glad to find this scarf! Tonight I knitted about 8 inches and it’s working great…only ripped out once. Thank u so much for sharing!! Can’t wait to finish. I have followed the pattern to the letter (5 times), but when I repeat the pattern (rows 2-9), instead of the pattern continuing on the diagonal, it ends up zig-zagging. What is wrong. Like everyone else, I love this pattern! I am going to try to make it narrower for a headband! Thanks! You would need to re-write the pattern to work in the flat. This would be very easy though, you would need to work each odd row twice and ignore the even rows. Hi Tanya, The pattern moves over every other row. thanks. i have done a number of traveling patterns similar to yours. i like its rhythm and proportions. I love love love this scarf pattern! I’m just about finished with it, and I was wondering…how can I make a matching hat? I can easily convert the pattern to be in the round, but I am worried about the top…how can you maintain the pattern with the decreases needed? Or should I just go with a woven x closure at the top with no decreases? Or do you have any other suggestions? I’m also wondering about a matching hat. This pattern is gorgeous! This pattern would work in multiples of how many stitches? I would like to make it smaller (not as wide)! Thank you!! It will work with any multiple of 4 sititches. Good luck with your project! I love this pattern! For some reason, when I work it I get more of a back and forth zig-zag rather that the continuous staggered diagonal rib. It’s fine and still looks great, but I can’t understand what I’m doing wrong. Have you experienced this happening? I realize you posted this five years ago, but I just found it. I’m making it now with some yarn I have left from an afghan. I love it! Thank you. Hi! How can I turn this pattern to knit in circular needles? Should I skip the wonrg side rows? I just finished row 9, I see the patern and it looks great. Thank you for sharing this fun and easy patern. Thanks for your comment, really glad you like it! Hello, great pattern! I am just having a problem with Row 4 as I somehow at the very end ended up with 25 stitches on my needle instead of 24, making it so that I would have to finish by purling 2 instead of 1. But at the same time it doesn’t even seem like one of them is a real stitch, just a random loop on the needle. Please help me!!! Hi Erika, It’s likely that when you were changing between knit and purl on one occasion you brought the yarn over the needle, instead of between the needles, which created an extra loop. You can either unravel a row, or just knit two together if you can see the point where it happened. Most often the extra stitch will have appeared at the start/end of the row. Thank-you for sharing this great pattern. I just love it. I’m going to make many scarves this year. Hi, thank you very much for this pattern. I have a question, on row 7, after the [k2,p2] it says to last 3 st 3….what is this second “3” number mean? Is it supposed to say sts? instead of the number 3? Thanks for posting this wonderful pattern! I’ve been looking for a really pretty pattern to use my chunky yarn with. I’m getting a major jump on my Christmas and Holiday knitting for this year! Thank you for sharing your talent for pattern making! Hi, beginner knitter here, bear with me. I love this pattern! Thanks so much for putting it up. When you show the odd and even sides, does this mean that you’ve just completed that side or you should be about to start one? Also, does that include the “row 1” that you only do at the start, or not? The bottom line here is that I messed up along the way and had to tear back several rows. Now I have no idea what row I’m on. Is there a way besides trial and error to figure this out? I have been knitting for long time and I have to say, you did an excellent job writing this pattern! I am half way done with one and it looks fantastic! Thanks so much! Show off your project! Add your photo to the It's a Stitch Up Flickr group and tag it with 'staggeredribscarf'.